Reported by johnathan_pontarelli@ipsd.org on 8/24/18. 'The Adventures of Stuart Little' is a joyful and jazz music filled production for children and adults. 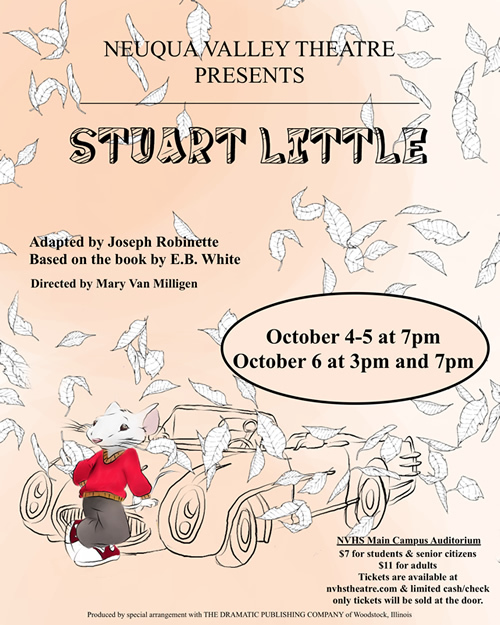 Join us as we follow Stuart, a mouse, adapt to his human family, including their pet cat Snowbell, endure the trials of being someone small in what can be a large and confusing world, develop a beautiful friendship with a kind bird, Margolo, and learn to share his own wisdom with children he meets. Tickets are available online at nvtheatre.com and only limited tickets will be sold at the door, as it is advised to purchase prior to the event.